Elgin Gay Baylor (born September 16, 1934) is an American retired basketball player, coach, and executive. He played 13 seasons as a small forward in the National Basketball Association (NBA) for the Minneapolis / Los Angeles Lakers, appearing in eight NBA Finals. Baylor was a gifted shooter, strong rebounder, and an accomplished passer. Renowned for his acrobatic maneuvers on the court, Baylor regularly dazzled Lakers fans with his trademark hanging jump shots. The No. 1 draft pick in 1958, NBA Rookie of the Year in 1959, and an 11-time NBA All-Star, he is regarded as one of the game's all-time greatest players. In 1977, Baylor was inducted into the Naismith Memorial Basketball Hall of Fame. Elgin "Rabbit" Baylor had two basketball-playing brothers, Sal and Kermit. After stints at Southwest Boys Club and Brown Jr. High, Baylor was a 3 time All City player in High School. Elgin played his first 2 years at Phelps Vocational High School in the '51 and '52 basketball seasons where he set his first area scoring record of 44 points vs Cardozo. During his 2 All City years at Phelps he averaged 18.5 and 27.6 points per season. He did not perform well academically and dropped out of school ('52–'53) to work in a furniture store and to play basketball in the local recreational leagues. Baylor reappeared for the '54 season playing for the newly opened Spingarn High School and the 6'5, 190 lb senior was named 1st team All Met and won the SSA's Livingstone Trophy as the Area's Best Basketball player for 1954. He finished with a 36.1 average for his 8 Interhigh Division II league games. On Feb 3, 1954 in a game against his old Phelps team, he scored 31 in the first half. Playing with 4 fouls the entire second half, Baylor scored 32 more points to establish a new DC area record with 63 points. This broke the point record of 52 that Western's Jim Wexler had set the year before when he broke Rabbit's record of 44 . An inadequate scholastic record kept him out of college until a friend arranged a scholarship at the College of Idaho, where he was expected to play basketball and football. After one season, the school dismissed the head basketball coach and restricted the scholarships. A Seattle car dealer interested Baylor in Seattle University, and Baylor sat out a year to play for Westside Ford, an AAU team in Seattle, while establishing eligibility at Seattle. Baylor led the Seattle University Chieftains (now known as the Redhawks) to the NCAA championship game in 1958, falling to the Kentucky Wildcats, Seattle's last trip to the Final Four. Following his junior season, Baylor joined the Minneapolis Lakers in 1958. In his three collegiate seasons, one at Idaho and two at Seattle, Baylor averaged 31.3 points per game. He led the NCAA in rebounds during the 1956–57 season. Fifty-one years after Baylor left Seattle University, Seattle U named its basketball court in honor of him on November 19, 2009. The Redhawks now play on the Elgin Baylor Court in Seattle's KeyArena. The Minneapolis Lakers used the No. 1 overall pick in the 1958 NBA draft to select Baylor, then convinced him to skip his senior year at SU and instead join the pro ranks. The team, several years removed from its glory days of George Mikan, was in trouble on the court and at the gate. The year prior to Baylor's arrival the Lakers finished 19–53 with a squad that was slow, bulky and aging. Baylor, whom the Lakers signed to play for $20,000 per year (a great amount of money at the time), was the franchise's last shot at survival. With his superb athletic talents and all-round game, Baylor was seen as the kind of player who could save a franchise, and he did. According to Minneapolis Lakers owner Bob Short in a 1971 interview with the Los Angeles Times: "If he had turned me down then, I would have been out of business. The club would have gone bankrupt." As a rookie in 1958–59, Baylor finished fourth in the league in scoring (24.9 points per game), third in rebounding (15.0 rebounds per game), and eighth in assists (4.1 assists per game). He registered 55 points in a single game, then the third-highest mark in league history behind Joe Fulks' 63 and Mikan's 61. Baylor won the NBA Rookie of the Year Award and led the Lakers from last place the previous year to the NBA finals, where they lost to the Boston Celtics in the first four-game sweep in finals history. Thus began the greatest rivalry in the history of the NBA. During his career, Baylor helped lead the Lakers to the NBA Finals seven more times. From the 1960–61 to the 1962–63 seasons, Baylor averaged 34.8, 38.3 and 34.0 points per game, respectively. On November 15 of the 1960–61 season, Baylor set a new NBA scoring record when he scored 71 points in a victory against the New York Knicks while grabbing 25 rebounds. In doing so, Baylor had broken his own NBA record of 64 points that he had set in the previous season. Baylor, a United States Army Reservist, was called to active duty during the 1961–62 season, and being stationed in Washington state, he could play for the Lakers only when on a weekend pass. Despite playing only 48 games during the 1961–62 season, he still managed to score over 1,800 points. Later that season, in a game five NBA Finals victory against the Boston Celtics, Baylor grabbed 22 rebounds and set the still-standing NBA record for points in an NBA Finals game with 61. Baylor began to be hampered with knee problems during the 1963–64 season. The problems culminated in a severe knee injury, suffered during the 1965 Western Division playoffs. Baylor, while still a very powerful force, was never quite the same, never again averaging above 30 points per game. Baylor finally retired nine games into the 1971–72 season because of his nagging knee problems. The timing of his retirement could not have been worse as this caused him to coincidentally miss two great achievements. First, the Lakers' next game after his retirement was the first of an NBA record of 33 consecutive wins. Second, the Lakers went on to win the NBA championship that season. The Lakers did give Baylor a championship ring, even though he had not been an active player. Baylor was the last of the great undersized forwards in a league where many guards are now his size or bigger. He finished his playing days with 23,149 points, 3,650 assists and 11,463 rebounds over 846 games. His signature running bank shot, which he was able to release quickly and effectively over taller players, led him to numerous NBA scoring records, several of which still stand. The 71 points Baylor scored on November 15, 1960 was a record at the time. The 61 points he scored in game 5 of the NBA Finals in 1962 is still an NBA Finals record. An underrated rebounder, Baylor averaged 13.5 rebounds per game during his career, including a remarkable 19.8 rebounds per game during the 1960–61 season – a season average exceeded by only five other players in NBA history, all of whom were 6'8" or taller. A 10-time All-NBA First Team selection and 11-time NBA All-Star, Baylor was elected to the Naismith Memorial Basketball Hall of Fame in 1977. He was named to the NBA 35th Anniversary All-Time Team in 1980 and the NBA 50th Anniversary All-Time Team in 1996. in 2009, SLAM Magazine ranked him number 11 among its Top 50 NBA players of all time. He is often listed as the greatest NBA player never to win a championship. The first biography of Elgin Baylor was written by SLAM Online contributor Bijan C. Bayne, and published by Rowman and Littlefield. "He was one of the most spectacular shooters the game has ever known", Baylor's longtime teammate Jerry West told HOOP in 1992. "I hear people talking about forwards today and I haven't seen many that can compare with him." 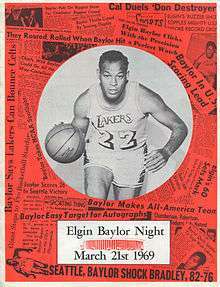 Tommy Hawkins, Baylor's teammate for six seasons and opponent for four (and later a basketball broadcaster) declared to the San Francisco Examiner that "[P]ound for pound, no one was ever as great as Elgin Baylor." He also said, "Elgin certainly didn't jump as high as Michael Jordan. But he had the greatest variety of shots of anyone. He would take it in and hang and shoot from all these angles. Put spin on the ball. Elgin had incredible strength. He could post up Bill Russell. He could pass like Magic and dribble with the best guards in the league." In 1974, Baylor was hired to be an assistant coach and later the head coach for the New Orleans Jazz, but had a lackluster 86–135 record and retired following the 1978–79 season. In 1986, Baylor was hired by the Los Angeles Clippers as the team's vice president of basketball operations. He stayed in that capacity for 22 years before resigning in October 2008 at the age of 74. During his tenure, the Clippers managed only two winning seasons and amassed a win-loss record of 607 and 1153. They also won only one playoff series during this time. Baylor was selected as the NBA Executive of the Year in 2006. That year the Clippers won their first playoff series since 1976, when the franchise was located in Buffalo, New York, and named the Buffalo Braves. In February 2009, Baylor filed an employment discrimination lawsuit against the Clippers, team owner Donald Sterling, team president Andy Roeser, and the NBA. He alleged that he was underpaid during his tenure with the team and then fired because of his age and race. Baylor later dropped the racial discrimination claims in the suit. Baylor's remaining claims were rejected by a Los Angeles state court jury on March 30, 2011, by a unanimous 12–0 vote. ↑ NBA Register: 1986–87 Edition. The Sporting News Publishing Company. 1986. p. 287. ISBN 9780892042272. ↑ NBA Register: 1986–87 Edition. The Sporting News Publishing Company. 1986. p. 289. ISBN 9780892042272. ↑ "Top 10 Teams In NBA History: 1971–72 Los Angeles Lakers". nba.com. Retrieved 2008-02-03. ↑ Dave McKenna (May 30, 2013). "An Unfamiliar Ring". Grantland. Retrieved May 31, 2013. ↑ Elgin Baylor Sues Los Angeles Clippers for Employment Discrimination ESPN.com, February 11, 2009. ↑ Lance Pugmire, "Elgin Baylor's lawsuit rejected by Los Angeles County jury", Los Angeles Times, March 30, 2011. ↑ The Official NBA Basketball Encyclopedia. Villard Books. 1994. p. 382. ISBN 0-679-43293-0.